When you invest in something, like a car, you probably try to take good care of it in order to get the most for your money. Abiding by a few simple car care tips can help you take care of you vehicle over its lifespan, reducing the cost, frequency, and likelihood of breakdowns and other issues. When it comes to car care tips, the first thing you need to do is understand your vehicle. Know what type of fuel is recommended by the manufacturer. High performance vehicles are often made to work best with a higher octane fuel, and running a lower octane option may compromise your fuel efficiency and the lifespan of your engine. You should also know the recommended tire pressure for your tires, and check them periodically to make sure they’re still within the recommended range. Additionally, know what type of oil is recommended for your car and get it changed regularly. The second set of car care tips you need to know about have to do with where you drive. You should understand what the climate is like in your area and determine if dedicated snow tires would be a good investment. You should also be aware of places where potholes and other road hazards are present. 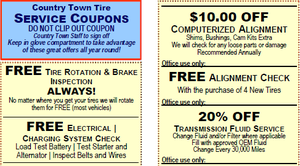 If you’d like to receive more car care tips, reach out to us at Country Town Tire & Auto Service Center today. We provide unparalleled customer service in the Hickory, North Carolina area.